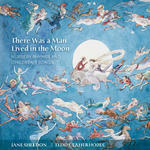 There was a man lived in the moon : nursery rhymes and children's songs / traditional tunes arranged by Andrew Ford ; performed by Jane Sheldon and Teddy Tahu Rhodes. Three Northumbrian songs : for soprano, harp and string quartet / Andrew Ford. Instrumentation: Soprano, harp, 2 violins, viola, cello. Contents note: 1. Bonny at morn -- 2. Maa Bonny lad -- 3. Dance ti thi daddy.